I recently posted about why I can't live without my homemade broth. 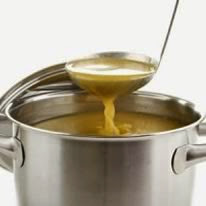 For me, broth is second only to real pastured butter on my must-have's for both health and lusciousness. However, in the spirit of my posts for Pat series, I admit everyone can't make homemade broth all the time. I still encourage you to make broth when you can. Simmering a turkey carcass is easier than cleaning the roasting pan. A chicken carcass is small enough to be brothed in a crockpot, which means you won't have to babysit a stockpot. But if you can't make enough to eat stock REGULARLY, which is crucial to good health, I have two possible solutions for you. Basically, you can buy a good-tasting broth or stock and make pseudo-broth from it. You need a yummy store-bought broth or stock, a good gelatin and dolomite. You can scale this up depending on how much stock you're working with. It's not quite as good as homemade stock, but it's pretty good. The gelatin provides the mouth-feel of real stock and both the gelatin and dolomite replicate much of the nutrition. You can get good culinary stocks, a good grass-fed gelatin and dolomite wherever it's convenient for you, but if you buy via my link, I get a small commission at no cost to you. So thanks if you buy from my links! I was very excited to discover Wise Choice Market on a friend's blog recently as they are a perfect fit for all the Pats out there. Wise Choice Market sells real food products like sprouted breads, cultured vegetables, soaked nut butters and... real bone broths, doing the work of traditional preparation of real food for you. Filtered water, organic free-range chicken bones and feet, organic onion, organic apple cider vinegar, organic garlic, Celtic Sea Salt®, organic parsley. Filtered water, organic grass fed beef bones, organic onion, organic garlic, Celtic Sea Salt®, organic parsley, organic apple cider vinegar. The chicken bones are simmered a full 24 hours and the beef bones 48 hours along with the onions, garlic and salt in filtered water with apple cider vinegar added to extract the minerals from the bones. Then parsley is added and the stock is cooled, then frozen in BPA-free packs, packed in insulated package with dry ice and shipped to you. Follow to buy bone broths in small sizes to sample or buy in bulk to save money.